In a recent story on Bard inferior vena cava (IVC) filters, NBC News released a previously confidential report comparing the relative safety of Bard’s Recovery IVC filter with that of competing products. 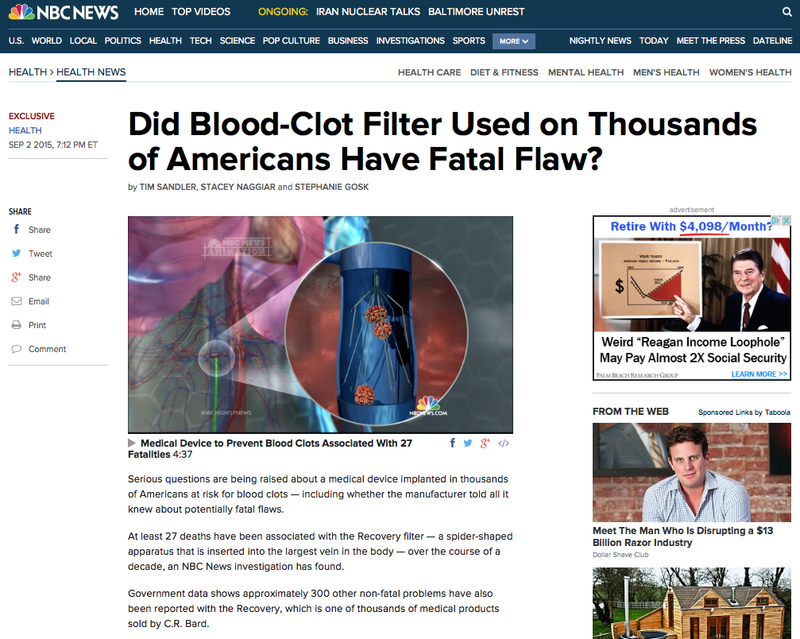 The report found that the Recovery filter posed a greater risk of filter fracture, device migration, and death than other retrievable and permanent IVC filters. A year-long investigation by NBC Nightly News has raised serious questions about why medical device manufacturer C.R. 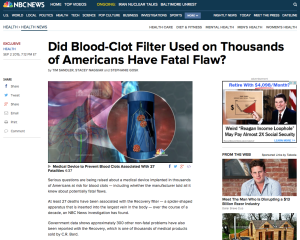 Bard, Inc. continued to sell and market its inferior vena cava (IVC) filters even after it seems to have become aware that its filters were failing and causing death and other serious injuries at rates significantly higher than other similar devices. A year-long investigation by NBC Nightly News has raised serious questions about why medical device manufacturer C.R. Bard, Inc. continued to sell and market its inferior vena cava (IVC) filters even after it became aware that its filters were failing and causing death and other serious injuries at rates significantly higher than other similar devices.